A great gift for foodies and gardeners alike, this kit lets you cultivate three varieties of tomatoes. A great gift for foodies and gardeners alike, this comprehensive kit lets you cultivate three varieties of tomatoes. 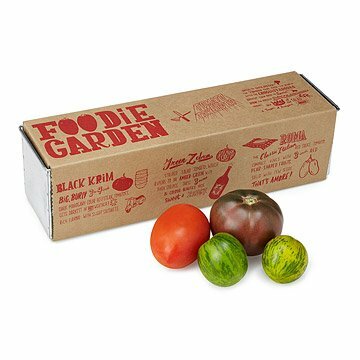 Featuring a stylish rectangular tin planter attractively packaged and enlivened with hand-drawn text and illustrations, the kit includes coco fiber growing wafers to start Black Krim, Green Zebra, and Roma tomatoes. It also includes instructions that make it easy to produce delicious tomatoes for salads, sandwiches, and recipes. Seedlings sprout in 1-4 weeks, and once started, can be transplanted to larger containers (inside or out) or to the garden to fully mature. Made in New Jersey. Kit includes Black Krim, Green Zebra and Roma tomatoes. Bought this for my 85 years old mom to give her a moment of joy. It was simple for her to plant and was so excited when she saw the sprouts after a week! So glad I found these products! I purchased several of these products as part of a gift for a friend that is into clean eating and wants to start her own garden. Everything about this product was a 10! She loved it! Great idea for the person who had everything! My father in law is do difficult to shop for but he loves to grow things. After recently relocating out of New Jersey this was perfect for him. I was excited to give him something he'd finally use. This tomato growing kit is really nice - the metal / steel growing container is well made and attractive. This is a fun way to grow / start some unique / heirloom type tomatoes. Easy to use and fun for the family to watch the plants grow.